Traditional African music that you can experience on recordings from the Congo has special qualities, often a particular musical focus you might never hear exactly like this anywhere else on the continent. A key element is the infusion of "Pygmy" vocal elements and their productive infusion into "Bantu" musics and conversely the influence as it then feeds back into its source to blend into a regional pan-stylistic complex. I assert this merely on the basis of long listening to available recordings. 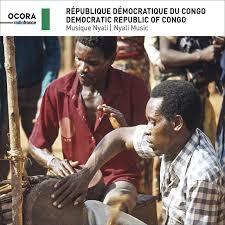 There is a new disc out from the region, specifically the Democratic Republic of Congo and it is entitled Nyali Music (OCORA C 560285). In the fine tradition of OCORA African recordings it offers fairly long examples of authentic musical practice on the ground level of villages and tribespeople. Anyone who loves traditional African music is likely to find this program stimulating and enjoyable, especially if you know and love Congo traditions. The strength of this program is especially in the choral call and response examples it has in abundance. The Nyali is a tribe located in two areas of the northeast, adjacent to the Ituri Forest. They have had close interactions with the Efe Pygmies. And musically you can hear their cultural interactions in some beautifully musical ways. The polyphony of the area is nicely present with choral blocks that many times call for a separate male counterpoint to the female vocal line or lines, and sometimes, even often the result is not a separate rhythmic line growing out of the polyphony but rather a sort of multi-stranded homophony, only each line is not tied in some direct chordal way to the others, but instead thrives in its independent horizontal trajectory--so then a sort of homophony-polyphony happens. And then too there are full-blown Pygmy-like cycles of rhythmically distinct independent, multiple lines sounding simultaneously at times, and that is something to hear. All this takes place with lively and complex undercurrents of hand drumming and other percussion that you can focus on too with profit. There can also be kalimba or guitar-harp-like string elements involved. The choral examples are outstanding and highly interesting (to me anyway), but perhaps you might find them most intriguing if you have other examples in your mind of the region's legacy? But I do think this is music of interest for anyone who might want more exposure to regional traditions even if you are not highly conversant with such things. The lead vocal parts are highly interesting too, with variational things happening and sometimes more than one solo voice creating another counterpoint! There is one especially intricate set of vocal counterpoints using kazoo-like sounding devices and it is ornate and very Pygmy-like, which is a very happy thing to hear. There are hocket ensembles of flutes with vocal and drums too, and that is quite a beautiful panorama of sound as well. There are also to be heard solo vocals with string, percussion, and/or etc. accompaniment. These too are very worthwhile to experience and get to know. I do very much recommend this one to all who already know they would be interested. And if you are plunging into African traditions for the first time, it is as good a place to start as any. Bravo OCORA and their excellent coverage of village Africa! I am happy to have this one, truly.